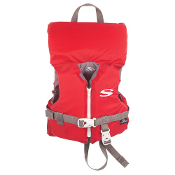 Our infant life vests are U.S. Coast Guard approved for safety. Made of durable nylon to be light weight. Two encircling belts, one leg strap, and a head pillow. For use at pool or beach. 10-30 lbs. Colors may vary.